In case you haven’t noticed, Three Ridges is a favorite subject of mine. It looms next to Wintergreen, which is actually atop a peak called Devil’s Knob. If I go just up the street from our house to the Devil’s Knob Overlook, which is close to the highest point in Wintergreen, I have a fabulous and ever changing view of Three Ridges. It makes a wonderful subject because it’s familiar and comfortable but different in every photograph I take of it, and I take a lot. I just finished a painting inspired by a photograph I stopped and took one morning in mid-January when I arrived. The clouds were lying heavy in the valleys and the peaks were above them. There was another layer of cloud above and a strip of colorful sky from the morning sun, which had been up for a while but was fighting the clouds. Below is the painting, followed by the photograph that inspired it. 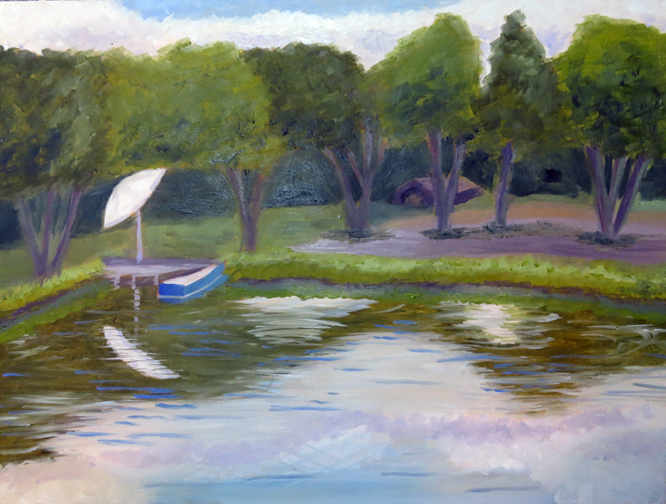 The painting is 36×18 oil on canvas. I’m sure you haven’t seen the last of Three Ridges. I have many more inspirational photographs. I’ve painted in in the Spring, Fall and Winter. I’m still searching for the perfect Summer view. Maybe when the weather breaks I’ll try my hand at a plein aire. Last Spring in a web search for art classes in Central Virginia I ran across a place called Nimrod Hall. More specifically, I found the Nimrod Hall Summer Arts Program. Nimrod Hall is a property in Bath County Virginia that dates back to the 1700s. At one point in its history it was a hunting lodge. For the last century or so it has been an art colony. It is now owned by Richmond based artist Laura Loe and her husband. The artist workshop program has been around for a while. Until last Summer they had only done week-long workshops, but they decided that weekend workshops would be a good way to reach more people, including those hesitant to commit to an entire week without seeing what it was like. I signed up for a weekend workshop with Andras Bality, also Richmond based. 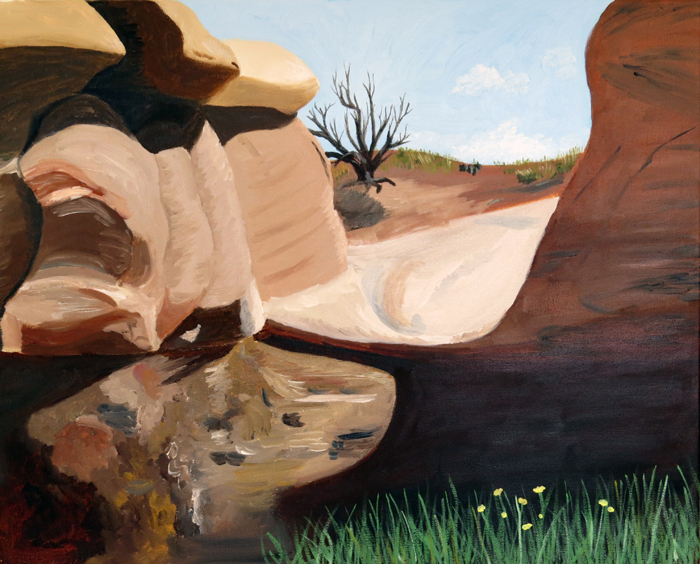 I was drawn to Andras’ impressionistic landscapes and believed I’d enjoy his class. I was right! First, Nimrod is rustic, but comfortable. The setting is beautiful. The photo below is of the main house. 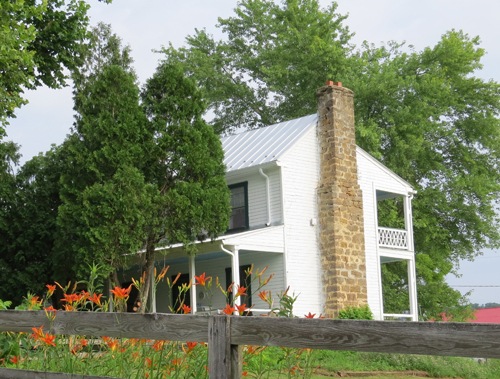 It’s a large property with many buildings situated on the Cowpasture River. The workshops include three home cooked meals a day, and the food is excellent. The weekend began with a demonstration by Andras on Friday evening. Then we painted all day Saturday. We set up a scene on the pond down by the river for our first painting. Below is my painting from that session (14×11 oil on board). It’s not my best work, but it was a good learning experience. Plein Aire painting is hard, and not something I’m practiced at. I usually paint from photographs. After we completed the first painting we were encouraged to chose another scene and paint a second painting. Along the hillside down by the river there was a row of cabins, from a boys camp. These were essentially in ruins, and not particularly pretty until you spent some time looking at them. I painted the tiny painting below (8×6 oil on canvas board) and gained a real appreciation for their beauty. Laura says she’s going to try to restore these so they can be used. She has her work cut out for her. In this workshop I learned several things from Andras that I have carried forward. First, I learned a lot about mixing color. He taught me that colors you would least expect to use in a mix can have a profound effect. For example, cadmium orange can be used to tone down colors without dulling them. I also learned to mix my whole pallet at once before beginning the painting. That doesn’t mean that you don’t continue to add and mix colors, but it gives you a broad starting point. Finally, I learned that clouds have many different colors in them. My engineer’s brain wants to see white and gray, but they have blue, purple, pink and many other subtle colors. Each of these has improved my results in paintings I’ve done since the workshop. I’ve signed up for a Watercolor Painting workshop by Purnell Pettyjohn at Nimrod July 10 -12 this summer. Watercolor has always been a challenge to me so I’m looking forward to becoming more comfortable with the medium. I was born and raised on the East Coast, but I love the desert. I find it spiritual and cleansing. It’s also beautiful and therefore I’m drawn to do paintings of it. 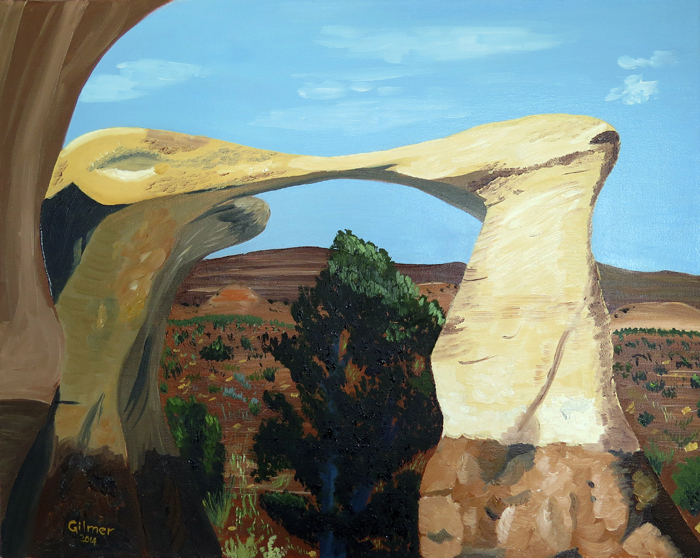 My experience painting the desert began a while ago with a trip to Santa Fe New Mexico. 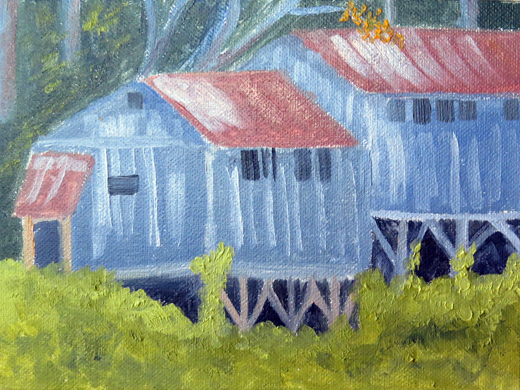 I enjoyed painting the adobe structures. Unfortunately, I haven’t photographed any of these early paintings (which aren’t very good). If I do I’ll come back and add them. In 2004 we went to Fountain Hills Arizona and addition to playing a lot of golf we did some hiking. 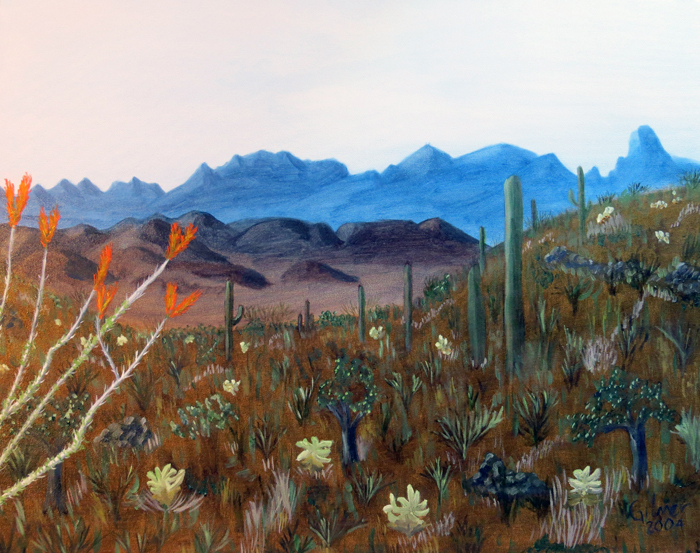 I painted this painting in 2004 from one of the photos I took on the hike. It’s 28 x 22 oil on canvas. I liked the painting, especially the highlights and shadows in the mountains, but always felt it lacked composition. In 2012 we went to Utah canyon country, which is unbelievably beautiful. I wasn’t painting much at the time, but when I started again the photos from that trip were some of my first subjects. 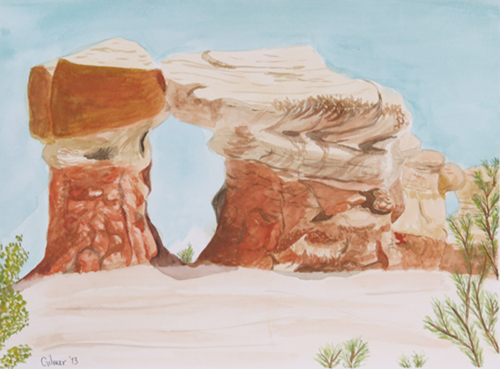 All three of these come from photos taken in Devil’s Garden, Grand Staircase-Escalante National Monument Park. These are all 16 x 12 water mixable oil on canvas. We’ll start with my least favorite of the three, the toadstools. I suppose I should skip this, but in the spirit of sharing both the good and bad in this blog I’m including it. I didn’t really get a good 3D look here and the rocks below the toadstools never really worked. 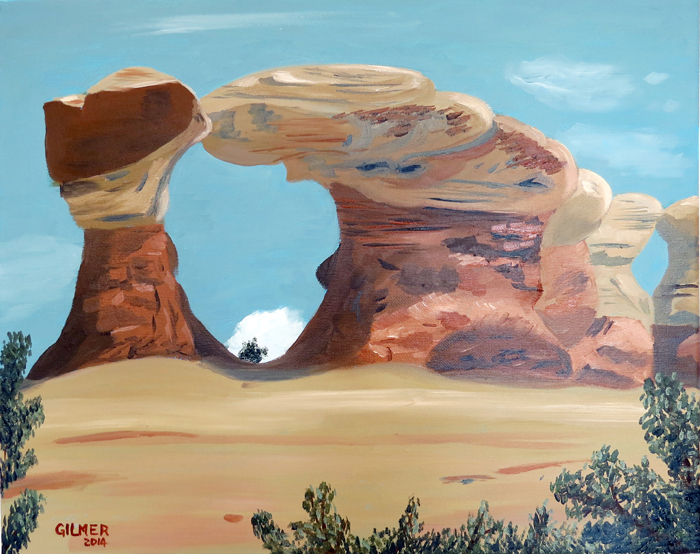 This next painting is an arch and I like it better. I realized later that I missed an opportunity to get more highlights and shadows in the distant mountains. The 3D effect in the arch itself is good. I actually did this one on my iPad too, after I did the painting. In many ways like the iPad version better. 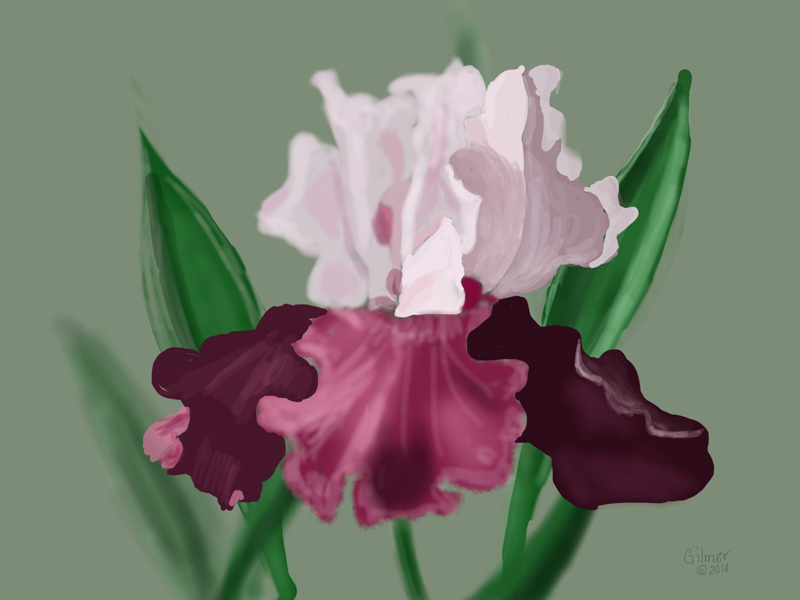 The Procreate tools allowed for much softer shadows and features in the arch itself. I also got better depth in those distant mountains. 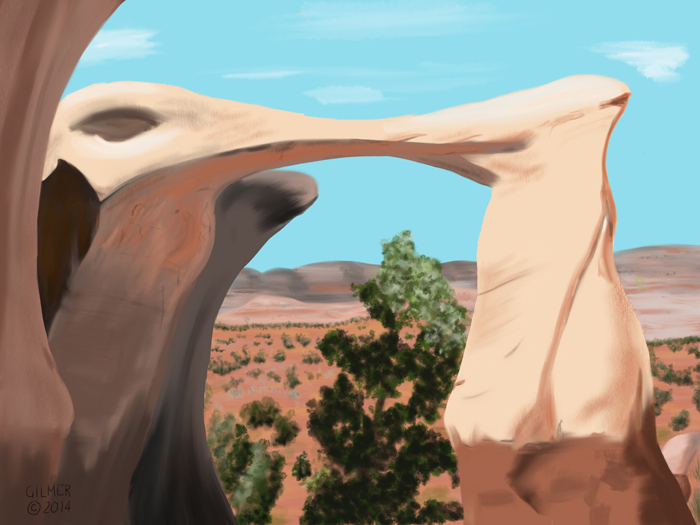 The third, and my favorite, is from a photo of a series of hoodoos on a very flat sandstone rock. This actually looks much better in person than in this photo. The photo flattened it out. The actual painting is very 3D. I also did a watercolor study of this before I did this painting. I’m generally not very good at watercolor. This is one of my better attempts at the medium. I’m a big fan of my iPad. I’m always looking for new ways to put it to use, and drawing on it seemed like a possibility. From my early iPad days I purchased apps like Brushes and Sketchbook Pro. More recently I got Procreate. Mostly, I would tinker around with them but I’d get frustrated before getting too far. Last spring I took a four-hour class through Falls Church Arts from Bobbi Pratte. Bobbi is a wonderful landscape artist and I’m going to take an afternoon painting class from her in May. I’m looking forward to learning a lot. In the class we experimented with Zen Brush, Sketch Club and Brushes. After we’d done some experimenting with each Bobbi gave us each a photo of a flower and we “painted” them using Sketch Club. I got a good start but ran out of time and had to finish my painting after class. The most important thing I learned was to use lots of layers! Below is my iris. 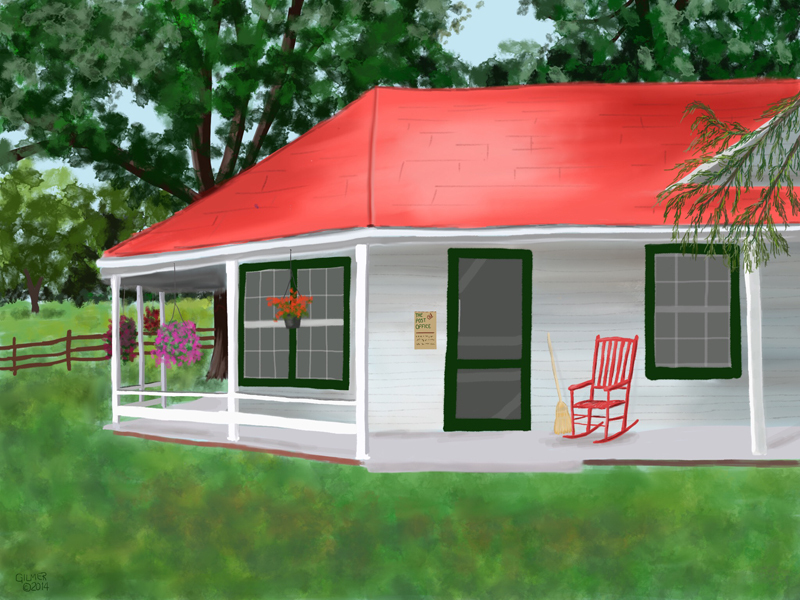 I was pleased with the results and since then II have gone on to do several more iPad “paintings”. Some have been studies that I did in conjunction with actual paintings, but others I just did for fun. I will save the studies to discuss with the associated paintings. Mostly I use Procreate. I’m more comfortable with that than Sketch Club. I have tried several types of stylus — my favorite for painting on the iPad is the Sensu Solo. As you know, I’m a big fan of butterflies, so I needed to try that out. 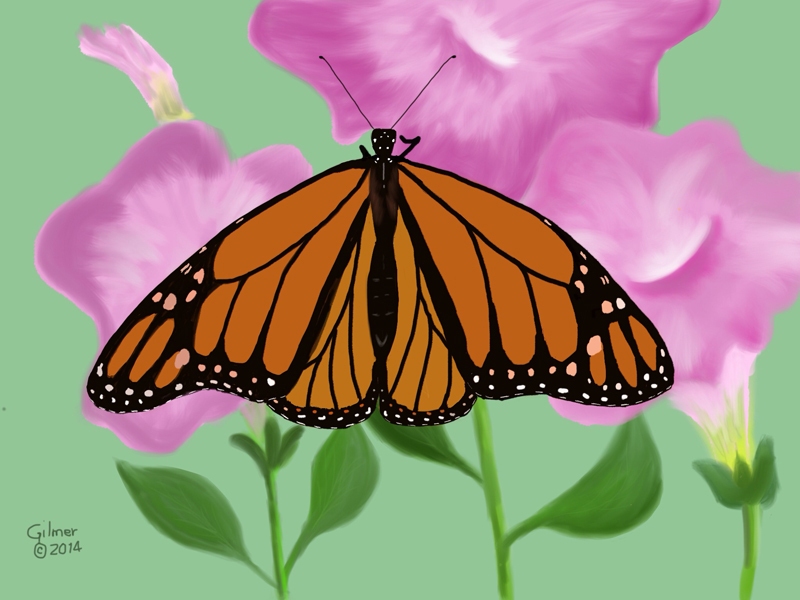 Here is my monarch on pink pansies. Finally, what’s really fun is that most of the apps record your brush strokes (mistakes and all) and you can play them back as a movie. Below is the movie showing the strokes involved in me drawing the butterfly. It’s 3 minutes and 16 seconds long.